Scientists from the University of Southampton have colour marked individual brain cells to help improve our understanding of how the brain works. 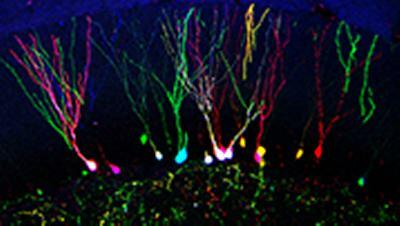 In neuroscience research, it is a challenge to individually label cells and to track them over space or time. Our brain has billions of cells and to be able to distinguish them at the single-cell level, and to modify their activity, is crucial to understand such a complex organ. The new marking technique, known as multicolour RGB tracking, allows single cells to be encoded with a heritable colour mark generated by a random combination of the three basic colours (red, green and blue). Brains are injected with a solution containing three viral vectors, each producing one fluorescent protein in each of the three colours. Each individual cell will take on a combination of the three colours to acquire a characteristic watermark. This approach allows researchers to colour code cells that would otherwise not be visible and undistinguishable from each other. Once the cell has been marked, the mark integrates into the DNA and will be expressed forever in that cell, as well as in any daughter cells. Dr Diego Gomez-Nicola, a Career Track Lecturer and MRC NIRG Fellow in the Centre for Biological Sciences at the University of Southampton, who led the multicolour RGB tracking research, says: “With this technique, we have proved the effective spatial and temporal tracking of neural cells, as well as the analysis of cell progeny. This innovative approach is primarily focused to improve neuroscience research, from allowing analysis of clonality to the completion of effective live imaging at the single-cell level. For the researchers, the next step is to change the physiology or identity of certain cells by driving multiple genetic modification of genes of interest with the RGB vectors. In the same way they made cells express fluorescent proteins, researchers hope they can change the cell expression of target genes, which would underpin gene therapy-based therapeutic approaches. The research, which is published in the journal Scientific Reports, was funded by the Medical Research Council (MRC), the EU and Wessex Medical Research. The research also involved Professor Hugh Perry from the Centre for Biological Sciences at the University of Southampton and Professor Fehse and Dr Riecken from the University of Hamburg, Germany.